(left) Hank Kammerer of the Neighbors Foundation, Brett Brennan and Joe Green. Sixth grade student Joe Green entered Connor Middle School in September and also entered Connor Middle School into a back-to-school sweepstakes at Wegman's. Recently a Wegman's representative came to the school to notify Joe of being winner of the sweepstakes, and to award his prize of five one-hundred-dollar Wegman's gift certificates. 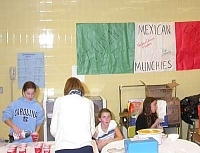 The Student Council held an International Night in early December and money raised at that event was ear-marked for the Neighbors Foundation. 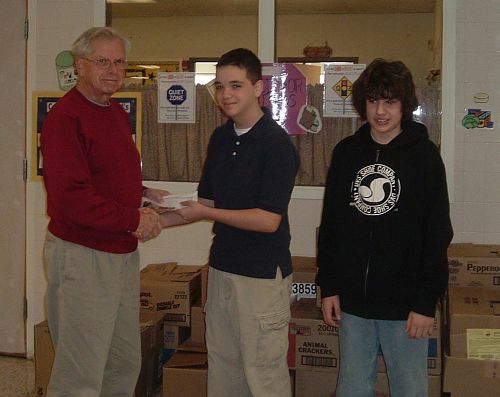 When Joe Green's good fortune was discovered, the Student Council added the gift certificates to those previous donations. The students are also bringing in non-perishable donations and have over 1000 items at last count. They have until the end of the week to break last year's record of over 3000 items. Neighbors Foundation representative Hank Kammerer visited the school on Wednesday, December 14 to accept the donations from Student Council President Brett Brennan, treasurer Steve Vitello and Joe Green. 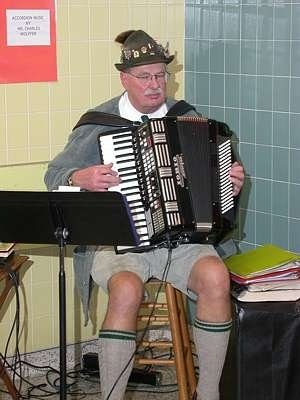 Annual Middle School International Night just gets bigger every year. Veronica E. Connor Middle School students and teachers combined to put on an even bigger and better International Night than ever before. 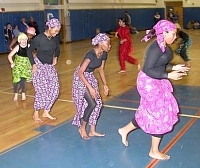 Exhibits, ethnic food, entertainment in the form of dance and music, and a basket raffle highlighted the well attended event on Friday, December 2, 2005. Music students of the Veronica Connor Middle School will perform in a winter concert at 7:30 p.m. Tuesday, December 20, 2005 in the high school auditorium, 1100 Ransom Road. The Power Team assembly at Veronica Connor Middle School on Thursday, November 20th left a powerful impression on the 6th through 8th grade students. Willie Raines and Matt Dopson snapped a baseball bat in two, ripped a 1200+ page phonebook in half, bent a steel rod like a pretzel and broke a stack of bricks with their elbow. Talk about getting the students attention! Along with the feats of strength came a message, "Live a life of excellence." Make the right choices, set goals, resist peer pressure, overcome the past, academic achievement, self-awareness & value, respect authority, be aware of the dangers of drugs/alcohol/ violence/ depression & suicide, and realize that "true love" waits. The Power Team assembly has been developed over 25 years and has been performing in more than 15,000 schools across the United States. The assembly was provided by the G.I.F.T.S. program of Grand Island. 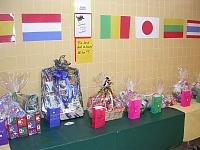 Students and faculty of Veronica Connor Middle School will hold the 7th annual International Night from 6-9 p.m. Friday, December 2, 2005 at the school, 1100 Ransom Road. The public is welcome to attend and there is no admission. 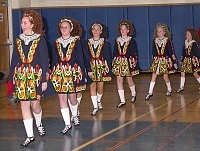 A variety of activities will include musical and dance groups, international dance, cultural demonstration, and an opportunity to make an international craft. Those attending will be able to sample International foods in the cafeteria for a small cost. School clubs and merchants will be selling their handicrafts, plus international theme baskets will be raffled at the end of the evening. A performance by "The Power Team," sponsored by the G.I.F.T.S. 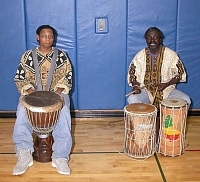 program, is scheduled for 2:45 p.m. Thursday, November 17, 2005 at the Veronica E. Connor Middle School. There is no charge to attend. 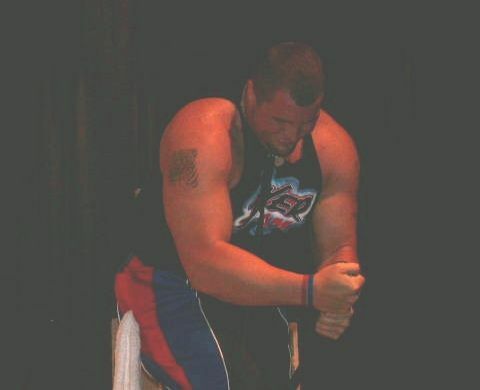 The Power Team is a group of world class athletes that has performed the world's greatest exhibitions of power, strength, speed, inspiration, and motivation in every state and in over 40 countries for almost 30 years. These giant men, many weighing over 300 pounds, can blow up hot water bottles like balloons, snap baseball bats like twigs, lift telephone poles overhead, rip phone books and license plates like pieces of paper, and smash walls of ice and concrete. 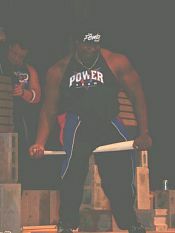 The Power Team has several world record holders, former NFL football players, and professional wrestlers. They have been endorsed by over 50 governors, senators, and congressmen for their positive contribution to the lives of America's youth. In 1976, The Power Team became the "Original" strength team, utilizing feats of strength to communicate positive messages to audiences in churches, civic centers, stadiums, and coliseums all across the nation, as well as the world. "We have been featured in People Magazine, The Saturday Evening Post, and on the popular TV show, Walker, Texas Ranger, watched by an estimated 16.5 million," a spokesman for the Power Team said. They have also been featured on ABC, NBC, CBS and CNN, and even spoofed on Saturday Night Live and Mad TV on the Fox network. For over ten years they have had their own television show called "The Power Connection," viewed by millions around the world each week. The Power Team has performed 15,000+ school assemblies over the past 20 years, and is ranked as one of the top school assemblies in the nation. Believing that inspiration and motivation equals academic and personal achievement, they tackle the tough issues of drugs, alcohol, violence, abstinence, peer pressure, and suicide. School staff and officials appreciate the ability of The Power Team to customize the topics, content, and presentations to match their audiences. From elementary ages to high school, young people all over the world have been challenged and changed by their positive messages. The various members of The Power Team are among America's most sought after speakers, encouraging people to live a life of excellence and challenging them to be the best that they can be. The Power Team has an unparalleled history, with proven effective methods, that churches, corporations, cities and organizations utilize to draw people from all walks of life, reaching their communities with powerful, life-changing messages of hope and inspiration. Student candidates wait to give their speeches. 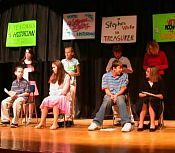 The 900 members of the Veronica Connor Middle School gathered in the High School auditorium on Thursday, October 27, 2005 to hear the class officer candidates speak. Two candidates won primaries held for historian, treasurer, secretary, vice president and president. 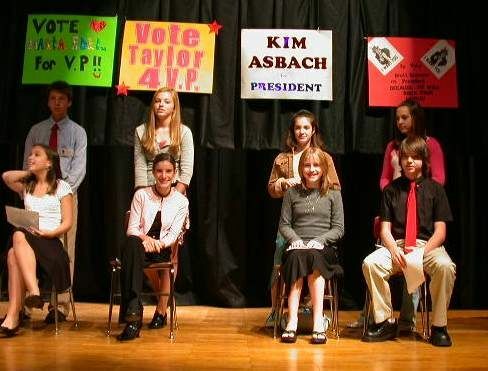 Each candidate was introduced by his/her campaign manager. The Syncopations sang the "Star Spangled Banner" and "America The Beautiful" at the beginning of the speeches. Voting was to be held in the classrooms right after the assembly. Connor Middle School PTA will hold the first of three meetings at 6:30 p.m. Thursday, October 13, 2005 in the Connor MS Library. This is a great opportunity to join and become involved. There will be a presentation and vote on the 2005-06 budget. Those interested in attending the NYS PTA convention in Buffalo are asked to contact PTA President Phil Valore, 773-2944 prior to October 10, 2005. "Please join us for the meeting." Veronica Connor Middle School teachers and staff wore their Viking Value t-shirts to school on Friday, September 9, 2005 and gathered at the front of the school for a picture as the students arrived for the day. The Viking Values are: be responsible, be respectful and be safe. The school has been promoting these values through posters placed in the school hallways and classrooms and in the student handbook. Veronica Connor Middle School PTA officers are (front left) Amy Garten (2nd VP), Katalin Posch (Rec. Secretary), Phil Valore (President), Kathy Chadwick (1st VP); (back) Mary Howard (1st VP), Tracey Kozlowski (Corr. Secretary), Bruce Benson (Principal), Donnette Rayhill (Council Delegate), Vicki Harnden (Council Delegate), Mary Kulak (Treasurer). Not pictured: Mary Jane Fonte (2nd VP). Registration of students in grades 6-8 who are new to the Grand Island Central School District will be held on Wednesday, August 17, 2005. Parents are encouraged to call Connor Middle School at 773-8837 to set up appointments for registration. An original birth certificate, proof of residence, a copy of your child’s last report card, and a record of immunizations will be needed to register. On Wednesday, August 17 at 10 a.m., Veronica E. Connor Middle School will hold an orientation program for parents and students new to Connor Middle School. Parents and students are invited to meet with the principal, assistant principal and school counselors to become familiar with the Middle School program and facilities. The program will be held in the Middle School Little Theater. This orientation is a repeat of the programs done for parents and students in the spring.  Wednesday, August 17 - Veronica E. Connor Middle School registration of after 1 p.m. students new to the District. Call 773-8837 for an appointment. Veronica E. Connor Middle School Moving-up Ceremonies took place in the Grand Island High School auditorium on Thursday evening, June 23, 2005. The processional of the 8th grade Class of 2005, numbering 246, entered the auditorium while the middle school orchestra, under the direction of Miss Deb Remson, played Pomp And Circumstance. Zachary Adams, Kelli Adreon, Lee Becker, Amy Bidell, Allison Boron, Kyle Clayton, Kaitlyn Czerwonka, Darren DelSignore, Korey DiMatteo, Amber Duda, Mary Egloff, Melissa Fargino, Gregory Feathers, Julia Figliotti, Ashley Fike, Kelsey Foote, Rachel Gaydosh, Samantha Gieselman, Zachary Gilbert, Andrew Ginsburg, Kaitlyn Hardison, Craig Hooper, Kaitlyn Incorvia, Taylor Jackson, Benjamin Kuch, Drew Lazelle, Jacqueline Maitner, Matthew Major, Kelsey Mash, James McDonnell, David McMichael, Charlene Meyer, Alexander Neutz, Marvin Pawlowski III, Sarah Pici, Christopher Podlucky, Alexander Richter, Robert Rutland III, Kayla Salonek, Jennifer Schaber, Carly Schory, Sierra Seese, Carly Snyder, Sheree Tamaklo, Emily Thompson, Jordan Tripi, Evan Tsembelis, Kelly Williams, Arlene Wunsch and Tyler Zikuski. Natalie Agnello, Alexa Amato, Robert Amsdill, Kaitlin Arida, Courtnnie Booker, Conor Bryan, Danielle Bush, Maria Buyer, Simarjot Cheema, Aaron D’Angelo, Jason Davis, Jenna Fanara, Angela Fusco, Leah Gangloff, Kaitlin Hager, Meghan Haley, Michael Hillock, Joshua Kahn, Michael Karpie, Taylor Kaufman, Benjamin Kose, Charles Lavallee, Kristin Millar, Katie Nordvik, Genna Nuchereno, Joseph Oliverio, John Osberg, Kelsey Patterson, Destiny Perez, Susan Pioli, Joshua Prygon, Scott Quider, Victoria Schaber, Timothy Shantler, Kayleigh Shephard, Kaileen Shoemaker, Kuljit Singh, Alyssa Spada, Robert Tates, Brianna Wojnar and Amanda Zernickel. Following the presentation of awards, each 8th grade student crossed the stage to receive a certificate from Principal Bruce Benson. Over 50 Connor Middle School students participated in building and eating the school's largest ice cream sundae ever. 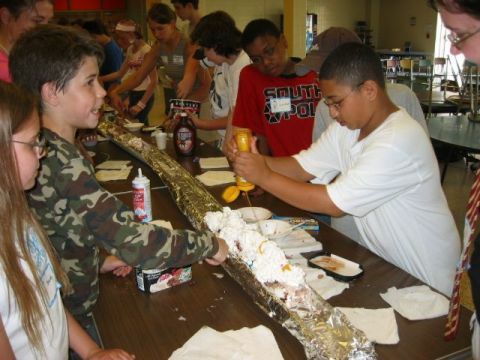 At a length of 50 feet, the ice cream sundae and all its toppings stretched the length of the Middle School cafeteria. 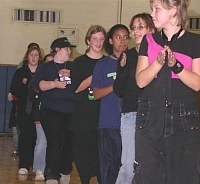 The event, held June 9, 2005, was part of a youth mentoring initiative by the AZZ-set Development Group (named in honor of Zack Zarbo, a well respected Grand Island High School student who passed away in October 2004) in cooperation with GIFTS and the Community Enrichment Council. Fourteen outstanding senior high students were chosen and trained in Asset development (The 40 Developmental Assets have been statistically proven to play a very key role in the positive development of young people.). Equipped with their new knowledge and eager attitudes, these exemplary students headed up groups of four middle schoolers to create their portion of the sundae, each group with its own creative style. One group even created a working volcano, lava flowing, due in part to the high temperatures on what has been one of the hottest days so far this summer. The focus for these mentors was on building positive identity and self-esteem, (only two of the 40 assets). The concept of youth mentoring itself was to create a venue for two other important assets, (as regarded by the Community Enrichment Council), namely, "Youth as a resource" and "Community values youth". Admission of one dollar or a non-perishable food item went to benefit the Neighbors Foundation, giving the middle school students an opportunity to show that they are a valuable resource to the community as well. Thirty dollars and forty food items were collected. Thanks and congratulations go out to all the students who participated in making this event a great success. We look forward to more events in the next school year and for the opportunity to help build a stronger generation of future leaders. After corresponding with students from Amherst Middle School, eighth grade French students had the opportunity to personally meet their pen pals. A bus load of about 50 students arrived at Connor Middle School late in the afternoon on Thursday, June 2, 2005 and were welcomed by French teacher, Susan Trabert, and her class. The students had the opportunity to practice their French and also played games and activities with an international flavor. Students had fun learning how Chinese cookies are made. 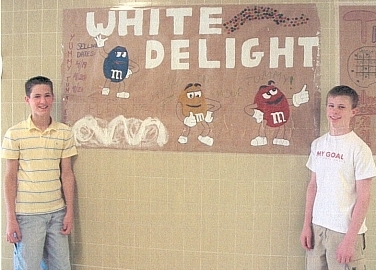 Shown left is Mr. Ed Anker and Dennis Donovan, center. 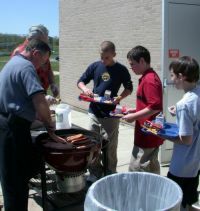 Once a year school lunch manager Dennis Donovan brings out the charcoal grill and cooks hot dogs for the high school and middle school lunch. Thursday, May 26 was the middle school's scheduled day and was nice and sunny, if a bit windy. 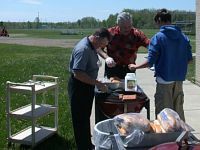 Technology teacher Mr. Ed Anker was helping at the grill as the students filed past with their lunch trays. 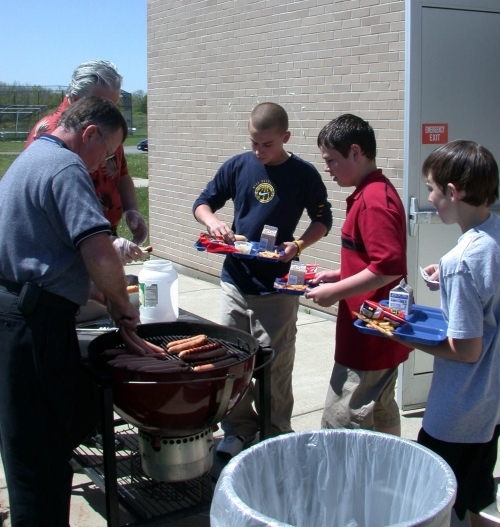 Mr. Donovan started the char-broiled hot dog tradition six years ago when he began his employment with the Grand Island school system. 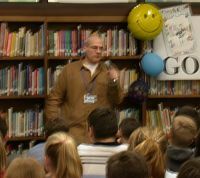 Gordon Korman talking with students. The Veronica E. Connor Middle School welcomed author Gordon Korman to the media center on Monday, May 16 and Tuesday, May 17, 2005. This was a long awaited visit as Mr. Korman had to reschedule an earlier date due to the birth of a child. Mr. Korman wrote his first book when he was 12 years old as a project for his ELA classes. "This Can't Be Happening At MacDonald Hall" was published in 1978 when Gordon was fourteen. Over twenty-five years later he has more than fifty middle grade and young adult novels to his credit. Mr. Korman talked with the students about how he gets ideas, the publishing process and funny stories from throughout his career. The students seemed to enjoy the presentation as they listened very intently and laughed in all the right places. The Veronica Connor Middle School 6th Grade Jazz Ensemble, directed by Mr. Alex Hughes, gave a great overall performance with accolades to the percussion section who were strong and steady throughout. Deceiving is the size of these musicians and the talent they displayed. 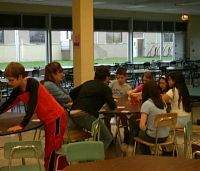 The Veronica E. Connor Middle School Student Council hosted its annual 8th Grade Honors Breakfast on Friday, May 6, 2005 in the school cafeteria. The Student Council funds the breakfast and presents each student with a small memento of the occasion. 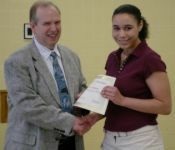 Schools Superintendent Dr. Thomas Ramming congratulated the fifty-six students who were invited to the breakfast, based on their achieving honor roll or high honor roll status for all three marking periods this year. Approximately half of the middle school faculty was also in attendance. Teachers Patty Myers and Kay Saunders are the Student Council Co-Advisors. Left photo: Art Club member Kate Garten is shown on right. Veronica E. Connor Middle School art teacher, Andrew Dulak, has announced that the Middle School Art Club is currently selling royal blue wristbands sporting the words, GRAND ISLAND VIKINGS. 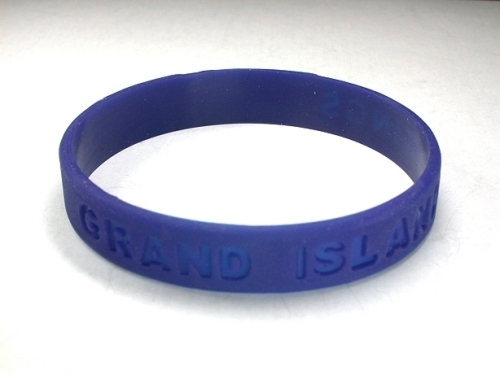 They are custom made just for Grand Island schools and are currently available for students and staff. The cost is $2 each and part of the proceeds will be donated to the Make-A-Wish Foundation. Mr. Dulak only has 1,000 wristbands which will be available on a first-come basis. One of the reasons that Business First ranked Veronica E. Connor Middle School as #11 out of 144 schools in Western New York, has to be its students! Once again, this semester’s entrepreneurs from Mrs. Mary Jane Fonte’s and Mrs. Marcia McHenry’s Home and Careers classes put their Viking Value of “Be Responsible” into action by making donations to the Make-A-Wish-Foundation, Roswell Park Cancer Institute, Heart and Soul Soup Kitchen and the Juvenile Diabetes Research Foundation. 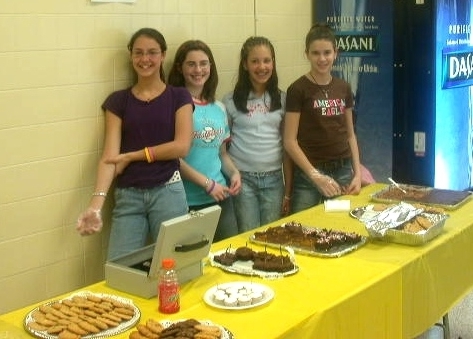 Funds were raised through the sale of baked goods sold outside of the cafeteria. In addition to learning proper interviewing techniques, resume creation, cover letter writing and application completion, Careers students learned that it is their responsibility as citizens of our school, community and country to reach out to those in greater need. Pictured below are each company’s advertising managers and the advertising campaign that helped to boost sales and allow for charitable donations. 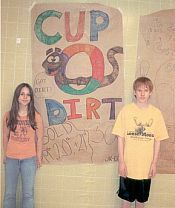 The annual Connor Middle School sixth grade sports night was held from 4-5:30 p.m. Friday, April 22, 2005. This is an opportunity for the students to whoop it up before the weekend, eat pizza and play different sports. 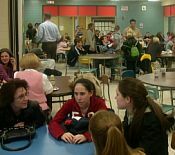 Bingo was being played in the cafeteria while an energetic game of getting a flying disc into a can was being waged in the hallway. 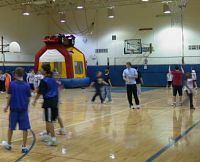 The gym held a bounce house, an on-going volleyball game and a half court basketball tournament. In the end, there was a wild game of basketball, the winning boys team against the winning girls team, neck and neck until the last few seconds when it was won by the boys. 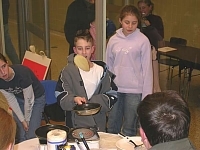 The Connor Middle School PTA sponsored a "Family Night" on Thursday, April 7, 2005 with a focus on "Kids Escaping Drugs." Volunteers from the PTA, Junior Girl Scouts and Youth Advisory Board manned the basket raffle table, the dessert tables and cafeteria line prior to the program held in the Grand Island High School auditorium. All money raised supports the Renaissance Campus in West Seneca. PTA President Donnette Rayhill introduced the Kids Escaping Drugs special events coordinator, Amanda Leitten who described the annual campaign to raise money for Renaissance Campus and its programs. Three residents of the campus told of their struggles with drugs and how they are turning their lives around. One of the participants was a 17-year-old girl who has lived on Grand Island with her family in the past and hopes to return this summer. Their stories were heart-breaking and one hopes they have beaten back the forces that brought them to that place. 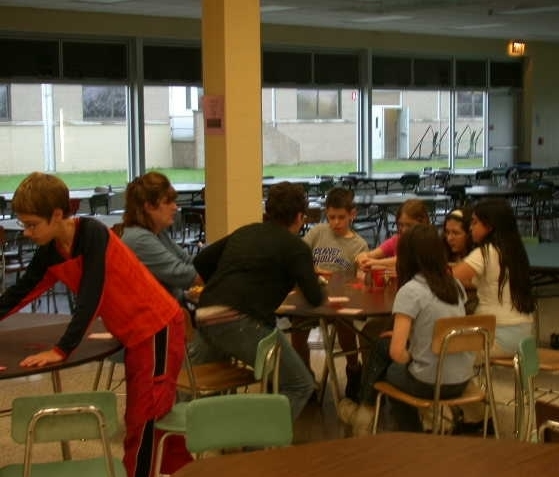 A Connor Middle School "Family Night" will focus on “Kids Escaping Drugs.” Families are encouraged to attend the event planned from 6-8:30 p.m., Thursday, April 7, 2005 in the Connor Middle School Cafeteria and the Grand Island High School Auditorium. Teens from the Renaissance Campus will educate the audience on what drugs kids are using today, how easy it is to get them, and where kid are getting them from. They will also discuss their own addictions and their road to recovery. MISSION: Raise, manage and distribute funds for development and support of facilities, education and prevention programs for adolescents and families of Western New York suffering from alcohol and drug dependency/addition. 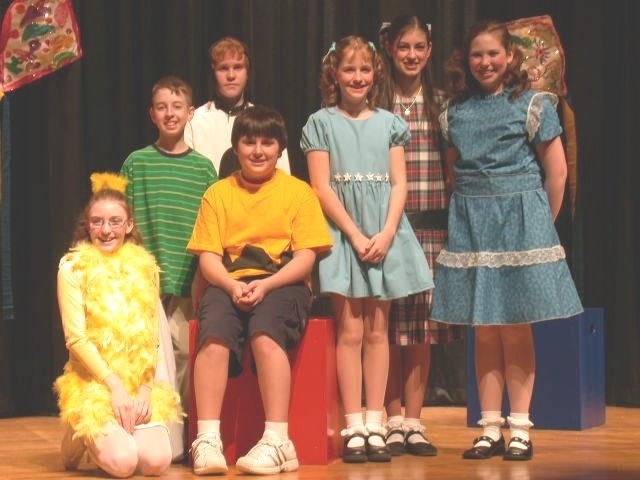 From left: Woodstock (Emma Henderson), Linus (Kearney Erhard), Snoopy (Lee Becker), Charlie Brown (Aaron D'angelo), Sally (Kim Asbach), Peppermint Patty (Tara Hook) and Lucy (Allison Boron). "Snoopy The Musical" was presented in the high school Tuesday night, March 22, 2005 to a near full house of parents, grandparents, aunts, uncles, family and friends. Music teacher Miss Debra Remson once again had the middle school students totally ready for the performance which drew lots of laughs and appreciative applause throughout the show. The production was made possible through the generosity of a Grand Island Foundation grant, Veronical Connor PTSA mini grant, Mary Ellen Jerge, Buffalo Embroidery Donation and Wynne Creative Group donation. According to the program, 67 students auditioned and after many hours of deliberation, the cast was picked. "These students worked very hard from the first rehearsal," Miss Remson said. "The more I gave them to do, the harder they worked," she said. "This cast has been so much fun. Rehearsals became the highlight of my day." Scroll down for more rehearsal photos. (left) Peppermint Patti (Tara Hook) & Charlie Brown (Aaron D'angelo), - Peppermint Patti (Tara Hook), Sally (Kim Asbach) and Lucy (Allison Boron) - Snoopy (Lee Becker) and Ensemble. 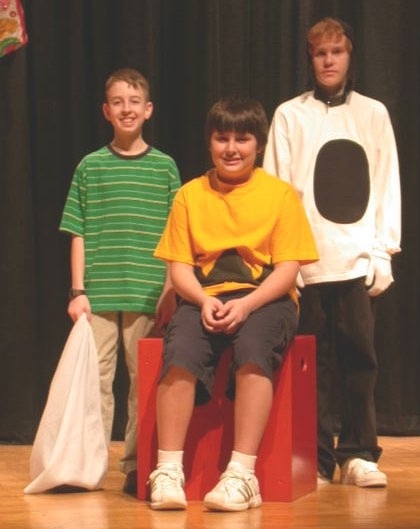 (left) Linus (Kearney Erhard), Charlie Brown (Aaron D'angelo) and Snoopy (Lee Becker) - Cast (see photo above) - Linus, Snoopy and Ensemble. 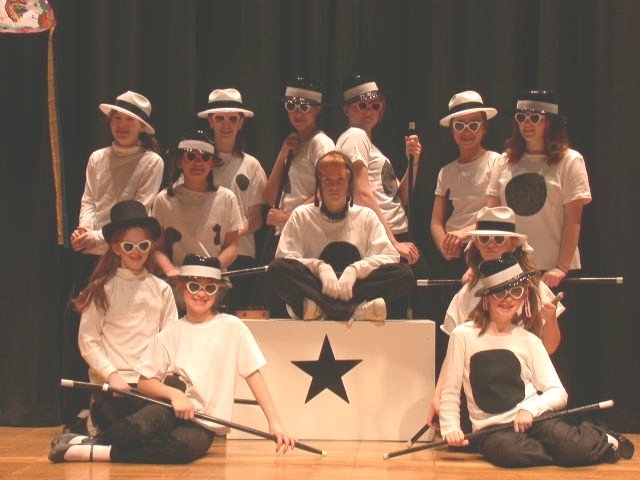 "Snoopy The Musical" was performed by the Connor Middle School students for the Kaegebein and Huth Road classes on Monday, March 21, 2005 at the Grand Island High School auditorium. The performance for the general public is Tuesday, March 22 at 7 p.m. Singing, dancing, humor...this show has it all. Director/Choreographer Debra Remson is a Connor Middle School music teacher who has been involved in the plays for many years. She stated in this year's program, "I believe this is the best cast ever!" Snoopy is played by Lee Becker, Charlie Brown by Aaron D'Angelo, Linus by Kearney Erhard, Lucy by Allison Boron, Sally by Kim Asbach, Peppermint Patty by Tara Hook and Woodstock by Emma Henderson. Kaitlyn Affuso, Beth Asbach, Alissa Bailey, Shannon Becker, Amy Bidell, Joe Connors, Renee Doermer, Kara Dudley, Shannon Farmer, Julia Figliotti, Lauren Fonte, Rachel Gaydosh, Charlie Lavalle, Hayley Metro, Andrea Nicolia, Sarah Pici, Katie Rustowicz, Ashley Turland, Kaitlin Symula, Brianna Wojnar and Molly Wynne. Veronica Connor Middle School students will take part in the musical Snoopy at 7 p.m. Tuesday, March 22, 2005 in the Grand Island High School Auditorium. Tickets are $5.00 and available from the students. There’s exciting news from the Science Department at Connor Middle School. 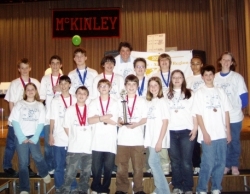 The school’s Science Olympiad Team placed second in a regional competition held Saturday, March 5, 2005 at McKinley High School. Science teacher, Carl Guidotti, stated that his students missed coming in first place by only a small margin. Sixteen middle school teams from Erie County participated in this year’s Olympiad, which focused on bringing science to life, understanding science concepts, and emphasizing the problem-solving aspects of science. The Science Olympiad is a national competition in which schools compete in a variety of science related events. These are technical events such as designing and constructing a bridge, egg dropping, robots, fossils and forestry where students come up with winning ideas and strategies. 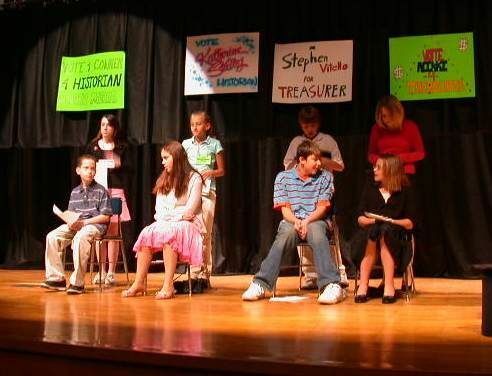 The top two teams, representing Amherst and Grand Island, have been invited to compete in the April 2005 state competition, which will be held in Rochester. Veronica E. Connor Middle School math teacher and "Going Bald for Bucks" organizer Bill Brodie reports that as of Thursday morning, March 17, 2005, the school has raised $10,522.00 for Roswell Park Cancer Institute with more donations coming in everyday. It is very likely that donations will top $11,000 this year, he said. 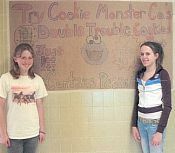 In the third year of participating, middle school students almost doubled last year's total of $6,100. What is now a huge event, started out with eight to ten teachers getting buzz cuts to benefit the Roswell Park Cancer Institute. This year, six hair cutters were lined up in the "shop room" shaving and cutting heads. Over 50 students and many teachers were involved in this great event. Four girls had 10" of their hair cut for Locks of Love, and 13 teachers, and 48 young men from grades 6 through 9 participated. The top fundraisers in each grade were Matthew Killian (Grade 6) with $816.25, Calla Clark (Grade 7) with $341.00, and Drew Lazelle (Grade 8) with $510.26. Mr. Brodie hopes to make this a combined effort next year with the high school and reach a goal of $20,000. This event was started in 2002 by Lakeshore History Teacher Anthony George. His sister, Cathleen, struggled for the third time with cancer. Anthony offered his moral support by shaving his head and from there the Lakeshore students grew this into a fundraiser to benefit Roswell Park Cancer Institute in memory of Cathleen George who succumbed to cancer on March 13, 2004. In the past three years students have raised over $72,000 for cancer research and patient care. The event has grown from 35 participants to over a 1000, and from one classroom to seven schools across WNY plus Buffalo State College. 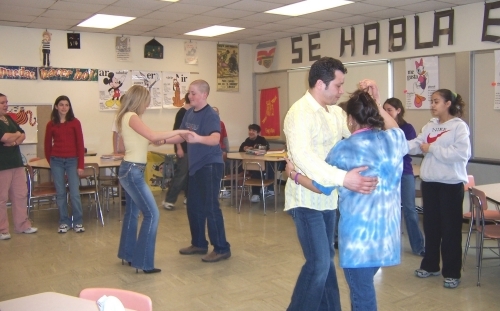 National Foreign Language Week is generally celebrated the first full week in March. 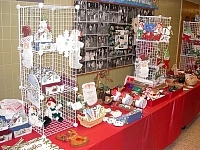 This year’s celebration took place March 6–12, 2005. 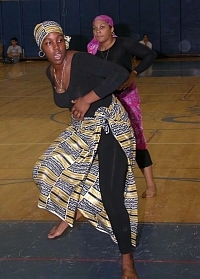 Many schools held events and activities, and this year was no exception. 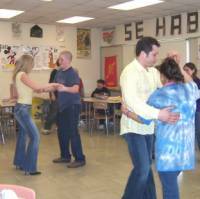 Middle School Spanish teacher, Diane Malaney, invited Andrea and Jim Martinez to teach salsa and meringue dances to her classes. They are the parents of Christian Martinez, who is one of Ms. Malaney’s Spanish students. Students also had fun each day trying to identify the “mystery voices.” Teachers and staff members were recorded on tape as they spoke phrases in Spanish and French, while students then had fun trying to identify the speaker and laughed at some of the mispronunciations. 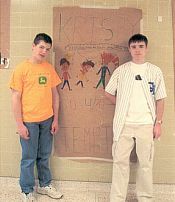 School hallways were decorated with students’ artwork which were displayed for the annual Foreign Language Poster Contest. National Foreign Language Week strives to highlight the importance of language learning by bringing students together to learn about other cultures, customs, music, and traditions. The Veronica E. Connor Science Olympiad team took 2nd place honors at the regional middle school Science Olympiad Tournament held Saturday, March 5, 2005 at McKinley High School in Buffalo. Eighteen area middle schools participated in the event, which includes competitions in bridge building, catapult launching, astronomy, anatomy, and many other areas of scientific application. Connor Middle School was awarded medals in eight of the 16 events, placing first in Experimental Design, Storm the Castle, and Fossils. The students will be attending the New York State Science Olympiad Tournament at St. John Fisher College at the end of April. This was only the 3rd year that the school has participated in this event, which makes their progress and accomplishment that much more impressive. Veronica E. Connor Middle School will hold its 3rd annual "Going Bald For Bucks Fundraiser" to benefit Roswell Park. 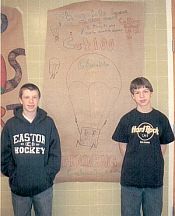 "Going Bald For Bucks" will take place at 8 a.m. Friday morning, March 11, 2005 in Room 191. The shaving of the head is to replicate the hair loss suffered by many cancer victims who go through radiation or chemotherapy every day. Ladies may also participate by donating at least 10 inches of their hair to Locks of Love (four girls have volunteered). Over 40 students and 13 staff members have signed up already. To support this worthy cause, contact Connor Middle School teacher Bill Brodie, 773-8830. Click for "Bald For Bucks Flyer". Veronica Connor Middle School students are in rehearsal for the musical Snoopy which will be produced at 7 p.m. Tuesday, March 22, 2005 in the Grand Island High School Auditorium. Tickets are $5.00 and available from the students. Student Council members from Connor Middle School held their annual carnation sale for charity on Friday, February 11. Students purchased red carnations which were then delivered to fellow classmates for Valentine’s Day. The students sold 2,984 flowers and raised $2,000 which will be donated to UNICEF to aid the children affected by the tsunami. “We’re very proud of our students and faculty for their outstanding response to this year’s carnation sale,” said Student Council co-advisors Kay Saunders and Patty Myers. UNICEF representative, Lee Tetkowski, thanked the students for their generous donation. Connor Middle School students in Ms. Trabert’s French class celebrated Mardi Gras Friday, February 11, 2005 by doing an internet project, making masks, and listening to traditional “Zydeco” music, which is a popular accordion-based musical genre hailing from the prairies of south-central and southwest Louisiana. Students enjoyed eating “King” cake and decorating the classroom with the traditional Mardi Gras colors: purple, green and gold. The ”King” cake is an oval cake in honor of the three kings after the Christmas holidays. The shape of a “King” cake symbolizes the unity of faiths. Each cake is decorated in the traditional Mardi Gras colors: purple represents justice, green represents faith and gold represents power. A small baby is baked into each cake. Custom holds that the person who finds the baby in their slice will be rewarded with good luck. That person traditionally is also responsible for bringing the “King” cake to the next gathering. The Veronica Connor Middle School 2005 musical, Snoopy, will be performed at 7 p.m. Tuesday, March 22, 2005 in the Grand Island High School Auditorium. Tickets are $5.00.